A rule of thumb is that websites or servers go down in the most inappropriate moment; this usually means a time when you are sleeping, are at work or in another location where you cannot check if your website or server is still up and running. A website that is not available for eight ore more consecutive hours can seriously harm your reputation and revenue that it generates. 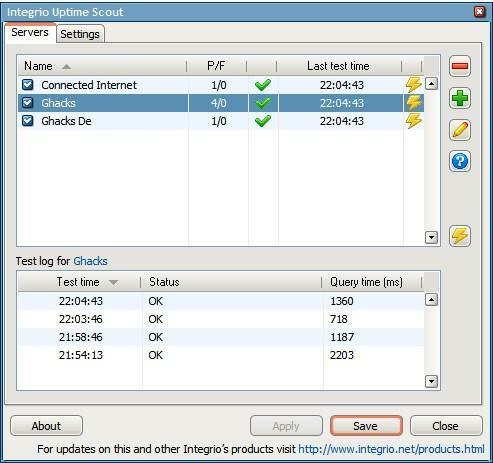 Integrio Uptime Scout is a free monitoring program for the Windows operating system. 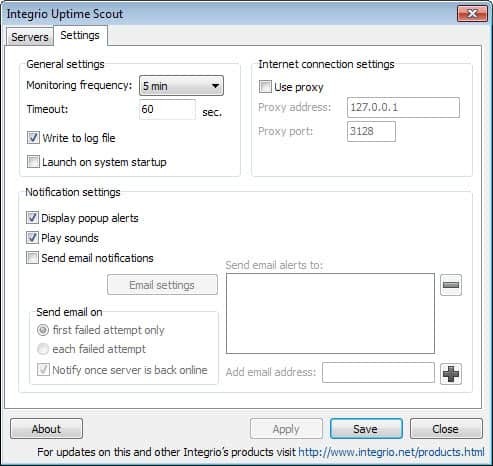 The Integrio Uptime Scout monitors your websites in an interval that can be specified between 30 seconds to 30 minutes and logs any failure to connect to it. The log can be useful to create an uptime statistic for your website which can be used to decided if it is time to change the hosting company among other things. Logfiles are useful but do not change the fact that the website is currently unavailable. The software can be configured to send out an email to an unlimited number of email recipients informing them that the website is currently unavailable, and when the website becomes accessible again..
A clever way to use this would be to send the email straight to your mobile phone or PDA which ensures that the downtime is kept to a minimum, provided that you have the means to react right away, for instance by contacting the hosting company. While those two features are nice already, the ability to run a program or script on the local computer when a check fails is probably the main reason for using the software. Each website can point to it's own script or application. Those scripts can for instance restart Apache, reboot a dedicated server or send an email to the hosting company informing them about the downtime and asking for assistance. There is only one negative aspect. The software has to run to monitor your websites and servers. I know that some users can't or won't leave their computers running all the time but I do not know of a comparable service that is running as a web service. Would not that be a niche market? Update: The program has not been updated in a while -- the product page lists Vista as the last supported operating system -- but it still runs fine on newer versions of the Windows operating system as well. You can modify specific settings in the preferences such as the monitoring frequency, the timeout period, or whether you want to write the information to a log file. Here you define the email alerts and email settings as well.